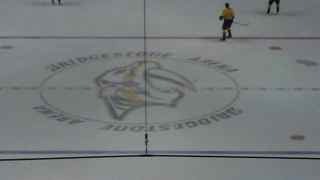 We did our first NHL game here in Nashville as the Nashville Predators took on the San Jose Sharks. Again, free parking is located next to LP Field (where the Titans play) and it was a short, scenic walk across the pedestrian bridge and the Cumberland River of about 15 minutes. There was a $3pp shuttle that we chose not to do. 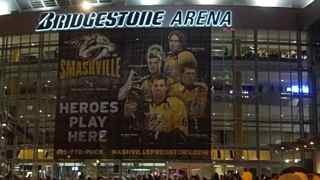 Bridgestone Arena is located right in the heart of the Broadway District, which means you get the chance to have a dinner and a few adult beverages before the game -- which we did. Had a great lager brewed here in Nashville, Hap and Harry's at the Broadway Brewhouse. 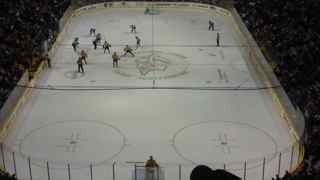 It was chilly in the arena, and had a great minor league baseball feel with the entertainment for the fans during breaks, and during the period intermissions. 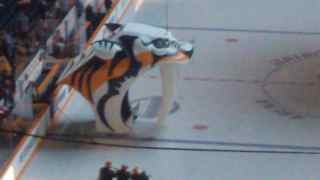 The sound of the puck hitting the stick in the arena is terrific, plus you can just see the entire game instead of just the small box on TV. Great times here in Nashville. 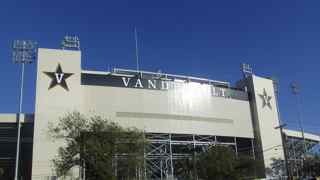 As a couple of veterans of Big 10 College Football, we wanted to check out the scene at Vanderbilt University, here in Nashville, as they hosted the Black Knights of Army. 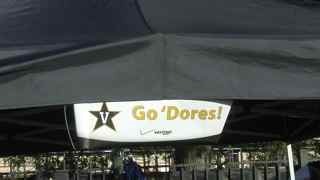 Vanderbilt is a member of the SEC, but their pregame scene is a little closer to the MAC. We Parked at a garage about 1/2 mile from the stadium. 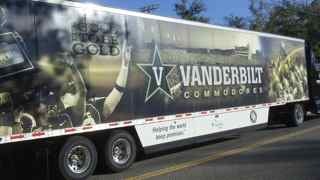 Knew from the Vanderbilt Athletics website it was free and a beautiful walk. The campus has a ton of space that is pedestrian only. There was a bar with a band across the street so we figured that was a good place to come back to. Didn’t see anybody in game mode until a block north from the stadium where they had tents and tables set up to welcome alumni (it was homecoming). 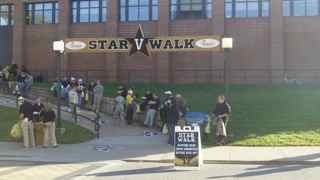 Across from the stadium was the "Star Walk" where the players make their entrance one hour and fifteen minutes before gamtime from the practice facility/locker room to the stadium. Had a few people lined up there, and there was 45 minutes left before they showed. 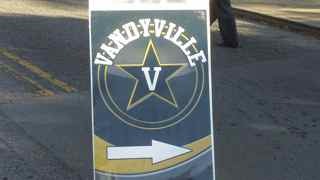 ‘Vandyville’ is basically the place to tailgate. 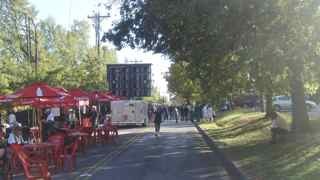 They take a street on the West side of the stadium and block it off. They have a stage for a live band at the far end that wasn’t playing two hours prior, and we were there for an hour, so not sure when they actually play. The University sells tent space for $600 for the season (which gets you two parking permits to the lot across the street from the stadium and that’s pretty much where things happen. 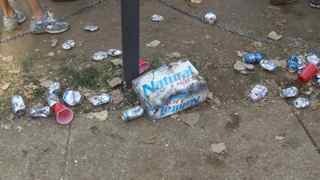 (We have a friend at Ohio State who pays about $3k for his tent space at an apartment complex about 1/2 mile from the Stadium). At the end close to the stadium, they have a video board showing the game ‘o the day, Chic Fila had a set up for the pedestrians. 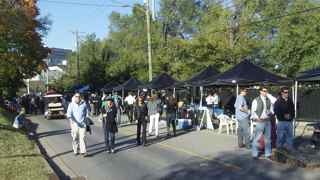 Didn't see a lot of corporates taking advantage of the tents, and thought it would be a good money maker for them. 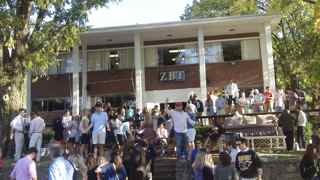 They were mostly groups of individuals who just went in together to have a tailgate. 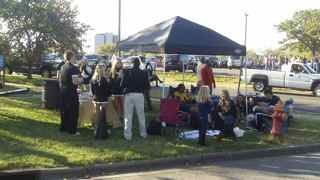 Hell, even the cheerleaders had their own tailgate where they were just sitting around chewing the fat. Lots of ties on the guys of all ages, boots and skirts on the girls. 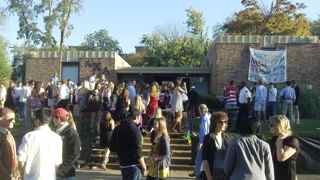 Alumni and parents pretty much ruled the day. 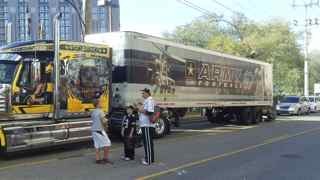 We did see a few Army fans and current Army military scattered about. There was a little NASCAR feel with the equipment trucks, both prominently displayed outside the stadium. Never see this at a Big 10 game, as they're always in a pretty secure place less some chucklehead would hop in and take off. The East end of the stadium were the Greeks and they were going at it hard. 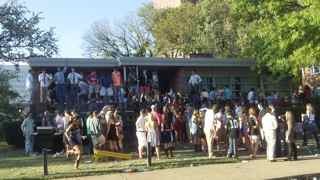 Each one had a sound system blaring, hundreds of kids partying, Natty Light cans strewn everywhere. Pictures really don't do it justice without the sound cranking. A solid two blocks of kids destined to be puking later. On the South end of the stadium is a parking lot for players families to tailgate. We asked an alum who was walking with us where the bars were and there was just this dumbfounded look. Nothing. A place inside the Holiday Inn, he said. No strip, no naughta. “Never thought of it, to be honest,” he said. It was a “real” game, because there were scalpers who 'needed' tickets and scalpers who needed to know if you needed tickets. “sh*t man, ain’t nobody makin' no money here.” Box office at the stadium had $30pp seats. Please. Wasn't going to drop 60 bucks for this one. Decided to roll back to the bar at the parking garage — band had stopped playing and they were closing soon. Damn. 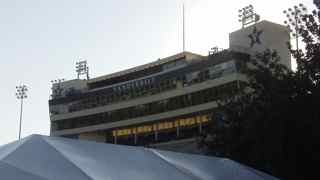 Didn't really get a true SEC Football tailgate feel, and we're looking forward to doing one in the "real" SEC some day. But, it was nice to see how the others live. We were married in 1983, and the first thing each of us wanted to do was have a dog. Neither of our parents would "let" us as we were growing up, and it was a goal when we got married. We wanted a Basset Hound, just because of the looks. Upon return from our honeymoon, we saw "free puppies" and went to take a look. Mom was a full blooded basset, Dad was a full blooded English Setter. (Today, that would be a 'designer breed' of some sort.) 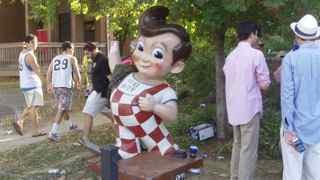 Our love of RV'ing and camping was born about the same time as Rambi, who lived to be 10, through all of our towns we lived in. When Rambi passed in 1993, it took us exactly one day to realize how much a dog moving about was a factor in making a house a home. Two days later, and a trip to the Ashtabula Protective League with our then 2nd grade daughter, we got Jobu. We thought we had gotten a black lab and, to this day, we're still not sure what breed she was. She was high strung, very agile, and great to have on your side. Two years later, along came Brutus, our first male. We had been kicking around the idea of being a two dog family as our daughter was growing, and we were gone with work. We thought a second dog would keep JoBu company. 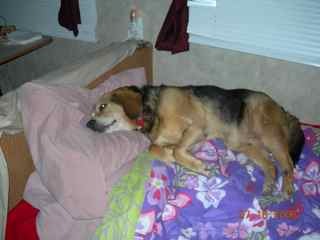 Brutus was from a student who couldn't keep him and supposed to be a chocolate lab, but grew to be a beagle/shepherd mix. He was a terrific dog with a tremendously loud bark. Brutus was really, really laid back, a perfect ying to Jobu's yang. As these two were getting on in years, and we knew we'd be full timing, we started deciding on getting a breed that we'd know what we had. We were between a Boxer (always having large dogs) and a Boston Terrier. Tragically, within 6 weeks of each other, first JoBu, then Brutus passed away -- they were 14 and 12 respectively. 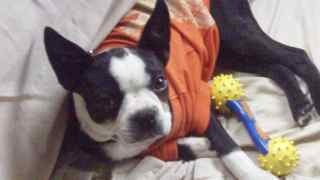 During that 6 week period, we got Sloopy, our first Boston, from a breeder. She's funny, makes us walk and exercise and a great dog for an RV. Having been a one dog family for four years, we were kicking around the idea of having a playmate for Sloopy. It would definitely be a Boston Terrier. As we were shopping next door to Two Rivers Campground, we struck up a conversation with one of the employees who had seen us walking Sloopy through the lot. She had Bostons, in fact, had just had a litter and couldn't find anyone to take the 9th one. 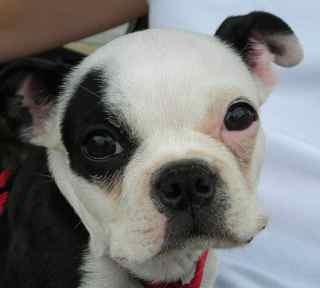 If you believe in fate, just earlier that morning we had corresponded with someone from Corpus Christi (where we'll be for the winter) about getting a Boston puppy. So, welcome to our family: Carmen. They closed the pool this morning at the Two Rivers Campground, a sure sign of things cooling down. Evenings have been getting cool, now they're predicted to get down right cold. 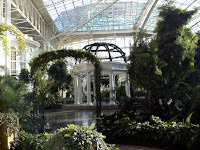 We took time out the other day to visit the complex at Gaylord Opryland. Wow, what a facility. 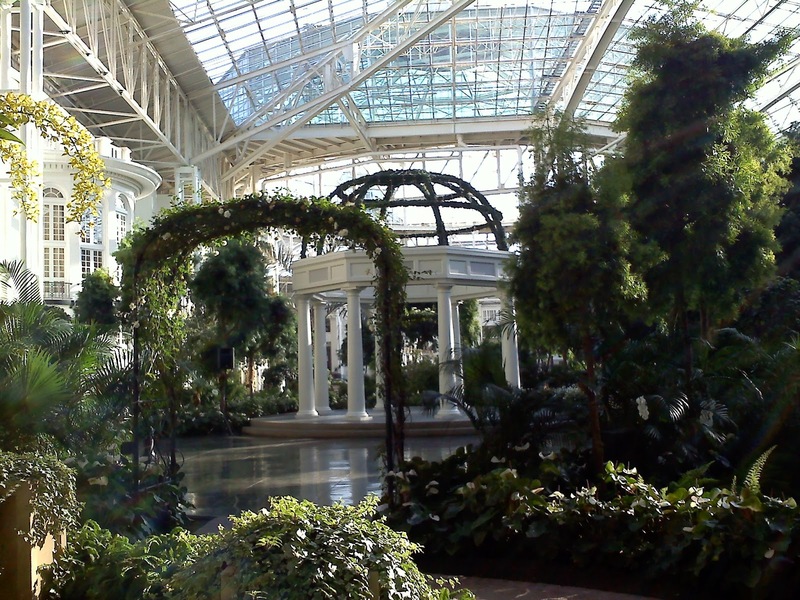 Divided into a few different sections, most all covered with an atrium roof, balconies that looked into garden spots -- tremendous place. 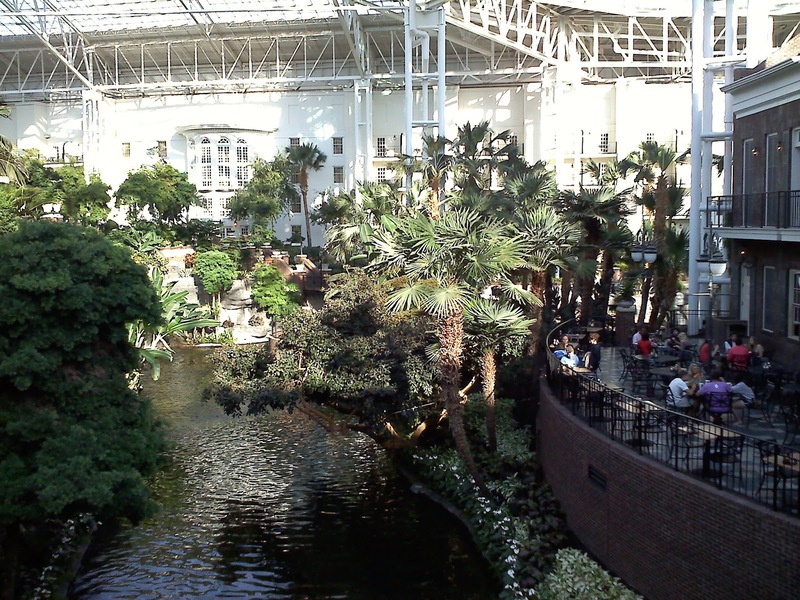 If you're going to go, you might want to have a beer at the Scoreboard Bar & Grill, then take the 10 minute walk over to Opryland -- at $2.75/beer, it sure beats the $18 to park your car. SEC College Football fans are some of the best at following their teams. 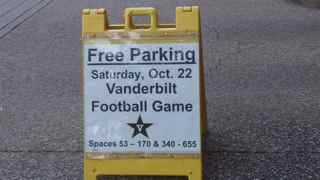 And, with Vanderbilt being the perennial whipping boy for the conference, why wouldn't you want to come to Nashville, enjoy the weather and watch your team thrash the Commodores? We used to do the same thing at Ohio State with Northwestern -- but then they started getting good, the weather in Chicago started seeming colder. You get the picture. So the Georgia Bulldog fans started arriving last night and there's about 5-6 rigs here at Two Rivers Campground ready for Saturday's game against Vandy. After a 'solid' four hours of work for Sims Family Tours & Travel in the morning on Friday, we decided to check out the golf at Two Rivers Golf Course which is about a mile or so from the Two Rivers Campground where we're staying here in Nashville. The greens had been aerated earlier in the week, so it wasn't the best experience, but we both thought it was a nice layout. Saturday was a great day, with a rally down the street to "Stand With Gibson" which featured good entertainment and some good speakers. Finally, while we were college football watching, our neighbor "Peggy" (the mayor of Hell's Half Acre) made some terrific chili that would have fed the whole campground I think. Had the pleasure of taking advantage of the beautiful (mid-80's and sunny) October weather here in Nashville by rafting to downtown on the Cumberland River. We loosely used the charts on the Corps of Engineer's site, mainly to make sure we didn't end up like we did in Oklahoma City where we put in, travelled about a mile and came upon a lock that was only able to be accessed by the tour boat that came by it. It took us about an hour to travel to downtown and another hour back. 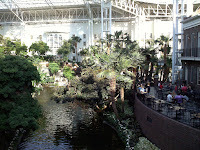 Our ramp was close to the Port of Opryland where two paddle wheelers do day cruises and dinner cruises. It would be a beautiful ride when the leaves are turning. 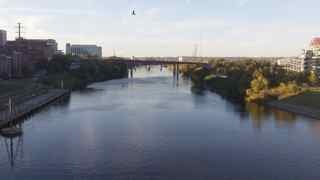 So hard to believe this river could get out of its banks and produce the kind of flooding it did in 2010. We only saw three pleasure boats (one was being hauled out) along the ride, but did see the General Jackson Paddle Wheeler steaming along from Opryland to downtown. As we approached downtown, we could see the "Batman Tower" in the distance. Then the full skyline appeared at the bend behind the bridges. There is a beautiful ampitheatre along the West Bank of the River, with the Tennessee Titans' LP Stadium on the East side. 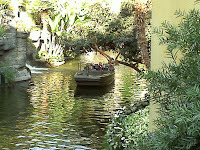 We were a little disappointed there wasn't any public docking or restaurants that catered to boaters. After getting close to the ramp at Old Lock and Dam Number Two Park, we went "Tom Sawyer" and just floated. The current we didn't realize until we turned the power off was amazing. And.....the silence.